"I did look up the site and it is quite impressive. 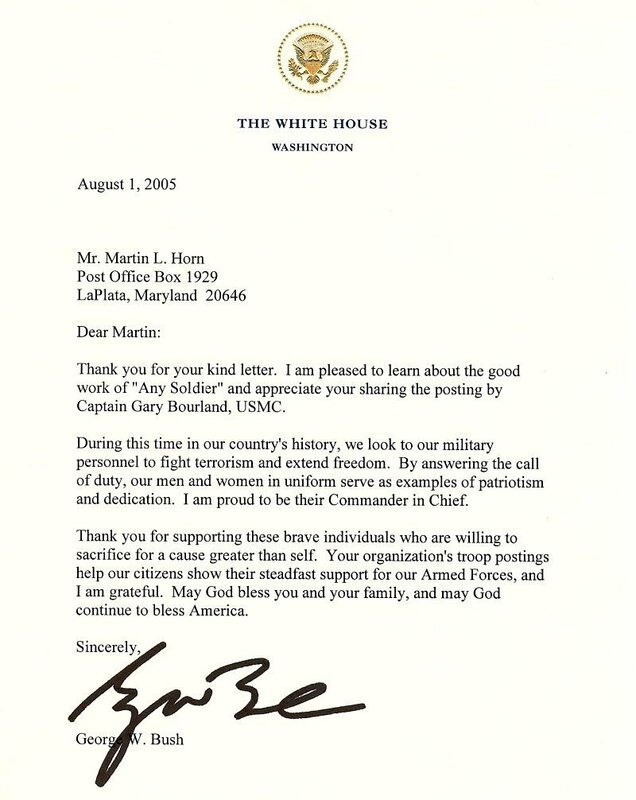 The stories from the deployed troops are quite interesting and it is clear that you are making a difference. Keep up the great work I will certainly promote the program anyway I can." 23 December: RTE, Radio Television Ireland does a story on TreatAnySoldier.com and AnySoldier.com. Recorded 2 December in Maryland, aired in Ireland on 23 December 2005. 21 December: Live radio interview on "The John Hancock Show". 10 December: Live radio interview on "The Family Radio Online" with Nancy Ryan, board member of Any Soldier Inc.
2 December: Live radio interview on the "Rich Hancock Show"
29 November: Live radio interview on "Frank Beckmann Show"
23 November: TV Spot on "News 14, Carolina"
23 November: Live radio interview on "Charlotte's Morning News with Al Gardner & Stacey Simms"
Any Soldier Inc. & Field and Stream Magazine work together to send high-end equipment to the troops! 21 November: "Local doctor continues package drive for overseas soldiers"
18 November: "Mail call: Packages, letters needed for empty-handed troops"
16 November: Live radio interview on "Real Talk with Joe Pursch"
12 November: "Guest Viewpoint: Keep troops in mind at holiday time"
11 November: "Blackhawks, Soccer Balls, and Freedom"
11 November: "The top 10 ways to salue veterans"
9 November: "Bake 'Em, Pack 'Em, Ship 'Em"
9 November: "Veterans deserve our thanks"
9 November: "Honor our country's veterans"
9 November: "Overseas but not forgotten"
3 November: "Gifts for Soldiers"
1 November: "Club helping kids, soldiers overseas"
27 October: "'Add Our Country's Service Men and Women to Your Holiday Greeting List,' Says Atlanta Man, 'And At No Cost to You, We Send Your Greetings to Our Troops in Iraq'"
27 October: "Web Site Connects Civilians With Soldiers Overseas"
In early September, Reva Ross stumbled onto the Web site www.AnySoldier.com, which connects soldiers, who may be lonely while stationed abroad with civilians, without the hassle of a middleman. 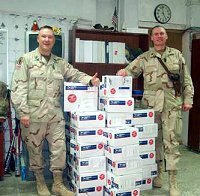 After perusing the site and reading entries, she felt compelled to help in some way, so she ordered 10 two-ounce packs of beef jerky and sent them to soldiers in Iraq. "No matter what you feel about the war these are our United States soldiers," Ms. Ross, 51, of the Upper East Side, said. "I think it's important to let them know that we know they are in harm's way." Soon after, a childhood friend, Roslyn Tucker, paid a visit to Ms. Ross, from Portland, Ore., and purchased about $100 worth of goodies for the soldiers. Ms. Ross handled the shipment. "I was helping my friend because I thought the cause was good," Ms. Tucker, 50, said. 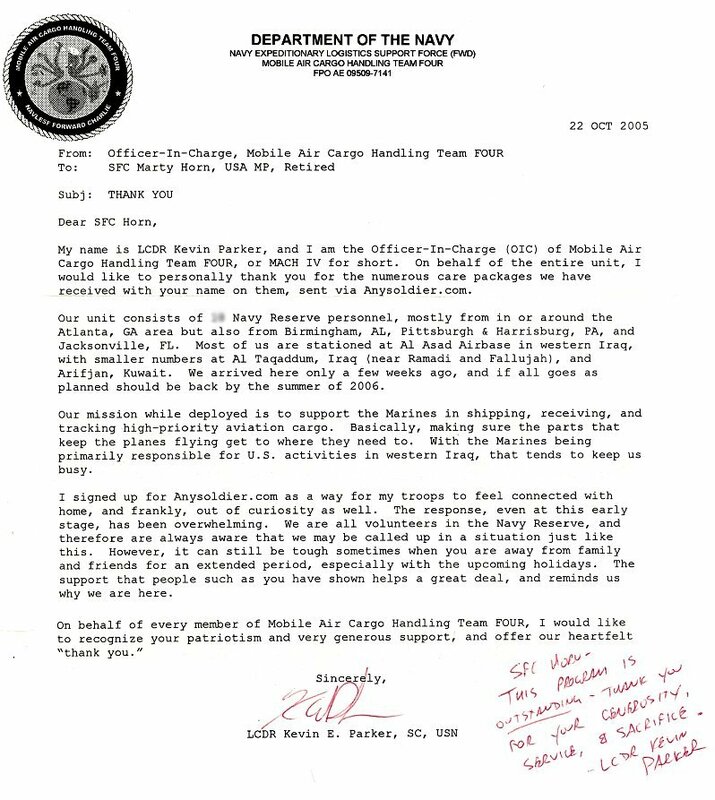 On October 17, Ms. Ross received confirmation for receipt of the second box of goods in a letter from a 19-year old man who has been in Iraq since January 15. He wrote, "The first thing that caught my eye was the popsicles. Hooaah. … I just wanted to say that I appreciate what you did cause you didn't have to do that. … Holler back. Would like to hear from you again. Much Love, Spc. Terrell Groves." The letter was a pleasant surprise for Ms. Ross. "I was not expecting this at all." The Web site warns readers: "DO NOT expect, or require, a reply from a soldier. DO NOT use this program if you expect or require a reply." 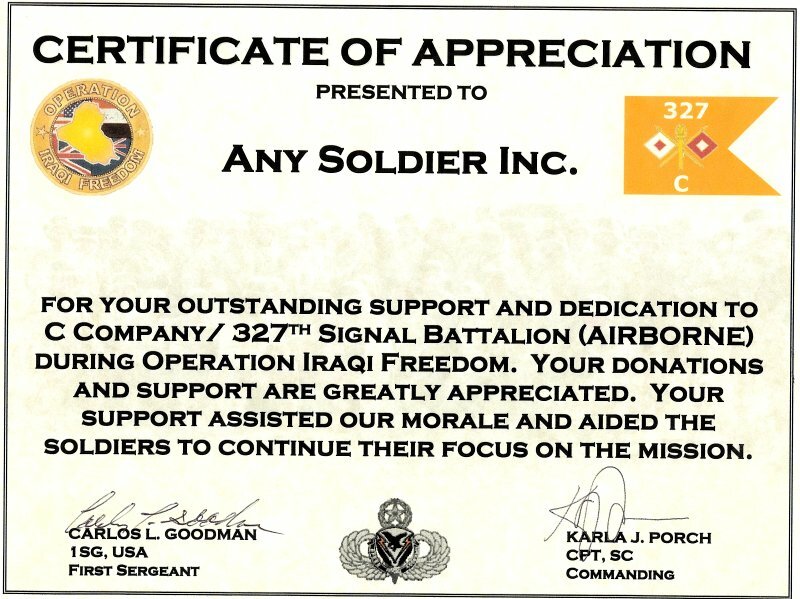 Any Soldier Incorporated is a nonpolitically affiliated nonprofit organization that allows civilians to learn what soldiers need and want — through a soldier contact in the unit — and then purchase and send the items themselves. 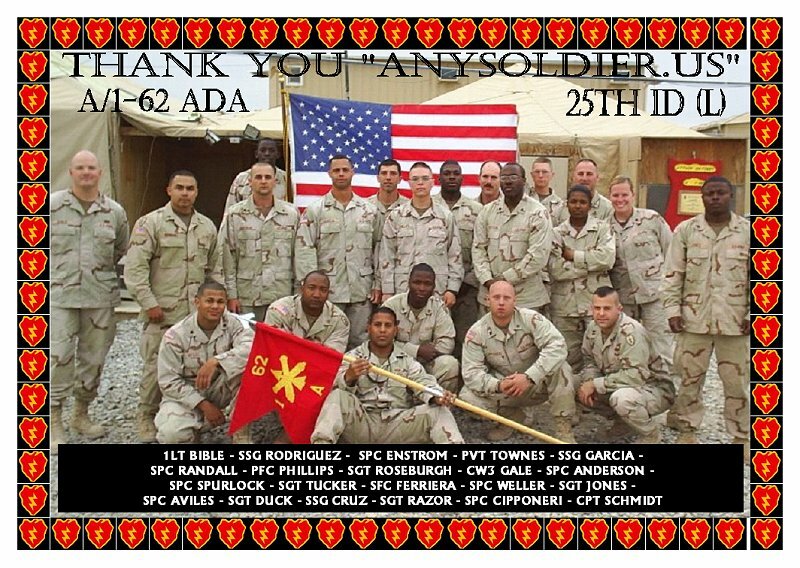 One 'www.AnySoldier.com' contact, Sergeant First Class James Kevin Kelly, 36, was told that if he had soldiers in his platoon that were not receiving much correspondence, he could go to the site and find people to adopt soldiers and send them goods. 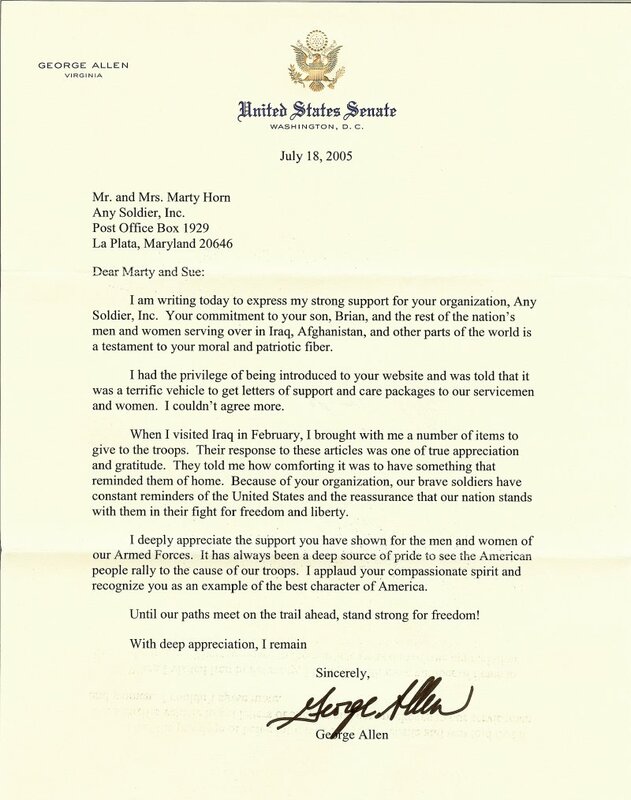 "I have plenty of family and friends that sent me stuff, but wanted to give something to the soldiers," Mr. Kelly wrote in an email from Iraq. "I plan on adopting soldiers when I get home and doing something that people did for us over here." The organization is the brainchild of Martin and Suzanne Horn, of La Plata, Md. 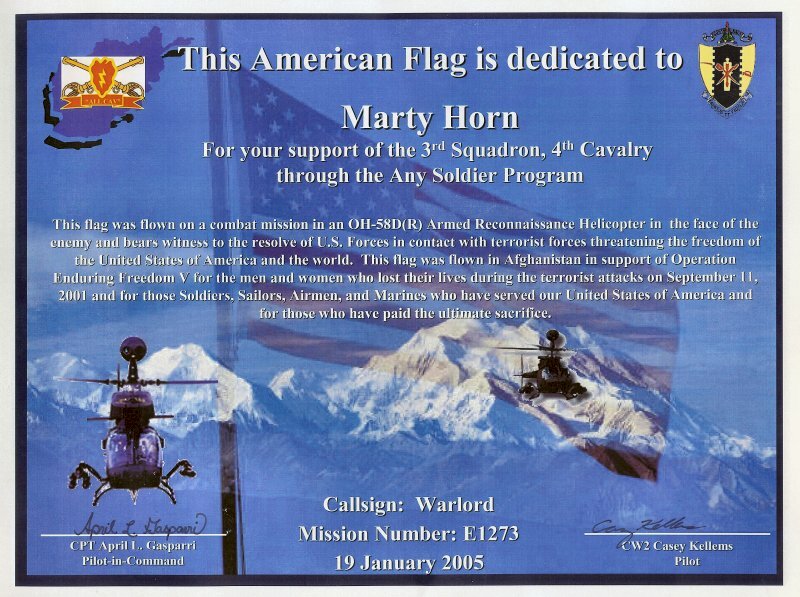 In 2003, their son Brian Horn was a sniper team leader in Iraq and Mr. and Mrs. Horn started sending packages to Brian, with the message "Attn: Any Soldier," and their son would distribute the goods to the soldiers who were not receiving mail. "So we started pouring out as much support as we could," Mr. Horn, 53, a retired military policeman, said. The couple launched the Web site for family and friends to send necessities to the unit. In January 2004, the efforts mushroomed to include any soldier "in harm's way," the Web site says. In the last two years, there have been more than 10,000 contacts that have received and distributed goods to units in 12 countries. 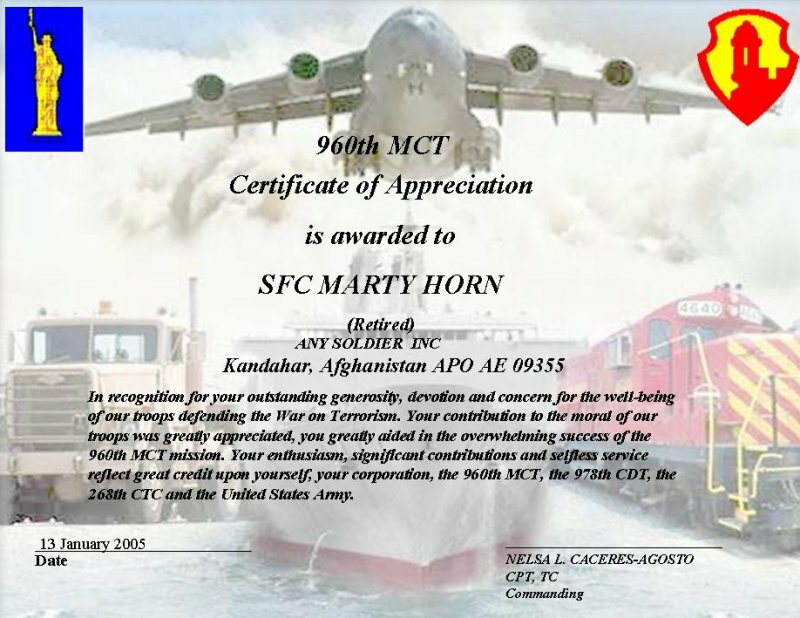 "We have personally affected half the deployed force," Mr. Horn said. Brian, who is now in Afghanistan, still serves as a contact. 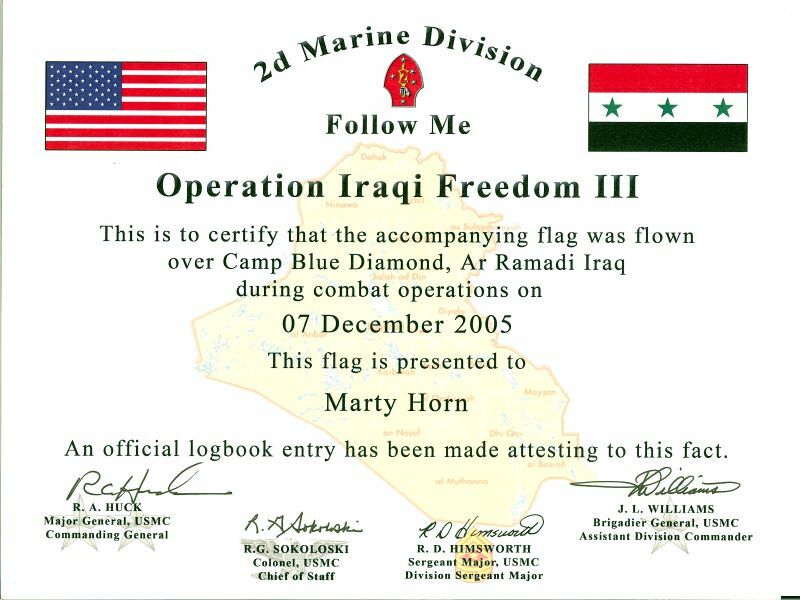 Supported by donation only, Mr. Horn sees no specific termination date for the site. "As long as there's a need, we'll be doing this," he said. 16 October: "Web site links soldiers with care packages from families"
16 October: "Soldiers' Web postings show life in war zone"
14 October: "Slain soldier's family 'overwhelmed' by caring"
25 September: "Teacher's influence felt half a world away"
7 September: "Web Site Helps US Soldiers"
7 September: "Benefit aims to give soldiers touch of home"
5 September: "Rangers backing soldiers"
4 September: "Anchorage woman, son eagerly await guardsman's return from Iraq"
31 August: "Young readers soldier on"
31 August: "Send support to our Troops"
30 August: "SD North Port Area Republicans ready for election year"
30 August: "Democrats organize care package drive for troops"
28 August: "Soldier's mom in Shelbyville takes pride in military package project"
25 August: "Because they are soldiers"
25 August: "'Any Soldier' project sends cards to soldiers in Iraq, Afghanistan"
20 August: "Class hears about life in Afghanistan from local soldier"
On page 7 of the 19 August 2005 issue of IHRA's DRM (Drag Review magazine). Click the picture for larger version. 19 August: "Communities respond to plea for goods to ease war's pain"
16 August: "Soldiers tote more than weapons"
15 August: "Michael Yon Interview"
15 August: "Bedtime stories from far, far away"
14 August: "Wish to help troops becomes project full of care, prayer"
13 August: "Troops say mail, items from home worth weight in gold"
11 August: Radio interview with Ron Thulin of KAHL, San Antonio, TX. 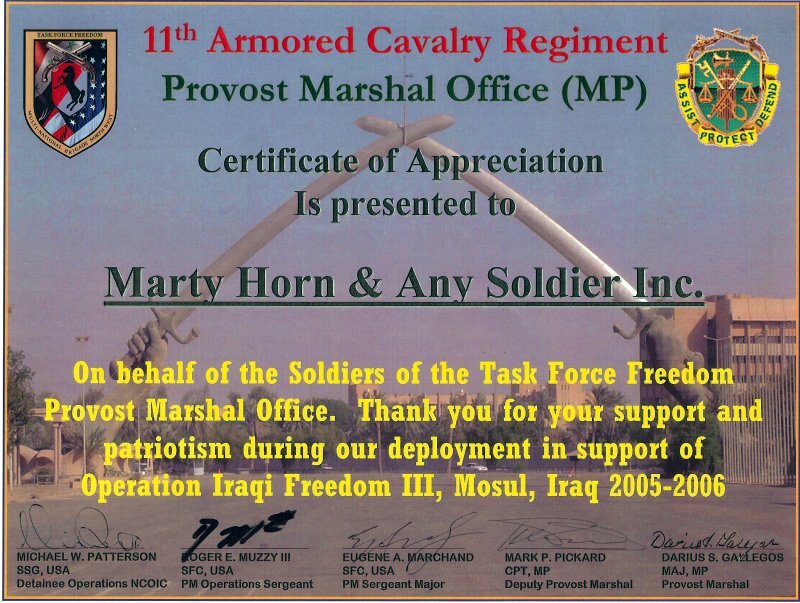 11 August: "Send a package to a soldier in harm's way"
11 August: "Care for troops abroad"
8 August: "Marty Horn, President of Any Soldier Inc. joins advisory board of Today's Family show"
Marty Horn, President of Any Soldier Inc.
Aug. 8, 2005, Deerfield Beach, FL – Platinum Television Group, a leading producer of educational programming, is proud to announce that Marty Horn, President of Any Soldier Inc., a program and website to encourage the public and American companies to contribute goods and products to those serving overseas in the armed services, will join the Advisory Board of the Today's Family show, effective immediately. It is aired on local and national television networks, and produced by Platinum Television Group. Horn will also introduce the programs in a special series featuring those businesses and companies that aid the corporation to contribute to the morale and well being of our military as well as to their families at home. All featured guests are the subjects of a five- or seven-minute segment written in feature-story format and presented in a visually exciting way. The shows will air during 2005- 2006 season nationally on targeted networks. In a stunning example of what one person can do to change a situation, Sergeant Brian Horn from LaPlata, MD, an Army Infantry Soldier with the 173rd Airborne Brigade in Iraq at the time, started the idea of Any Soldier to help care for his fellow servicemen. 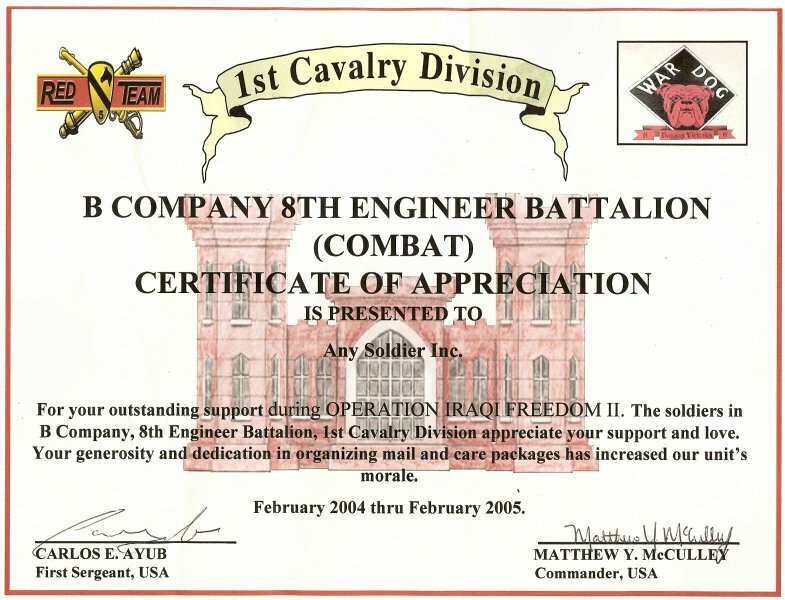 He agreed to distribute packages that came labeled "Attn: Any Soldier" to those who were not getting mail in August 2003. 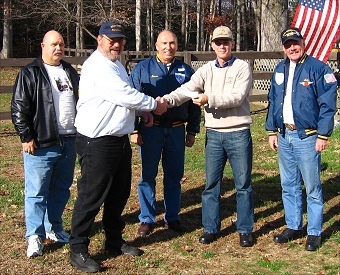 However, due to overwhelming requests, at the beginning of 2004, the Any Soldier effort was expanded to include any member of any of the Armed Services in harm's way. Brian’s parents were frustrated—they wanted to help the effort. 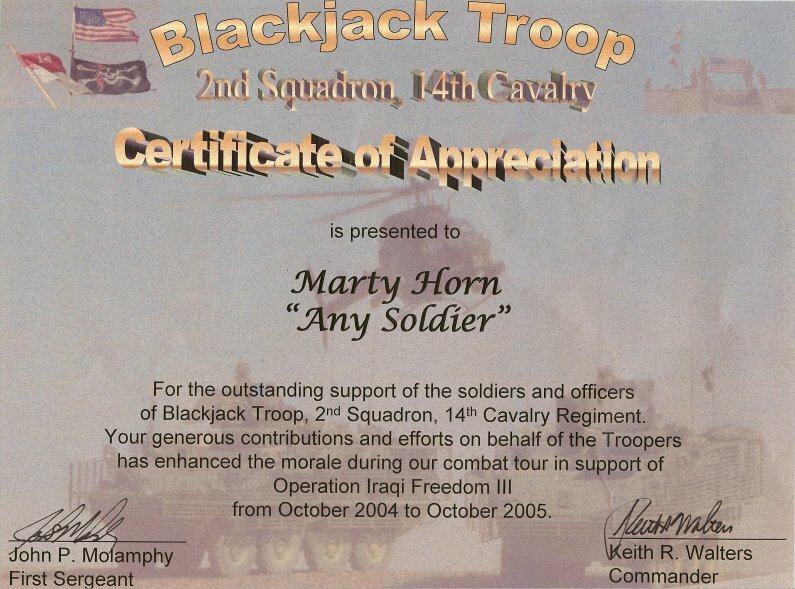 Marty Horn had spent 20 years in the Army as a military policeman. After retiring in 1993, he got into Internet technologies. Together with his wife, Sue, they worked the concept of Any Soldier with their son. Marty built the web site and continues to maintain it. 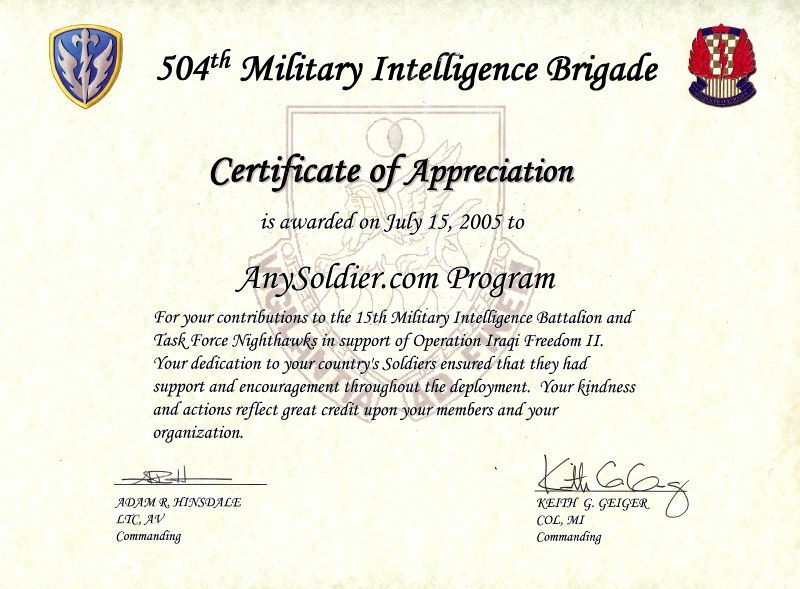 The success of AnySoldier.com has far exceeded expectations and continues to grow with the invaluable help and guidance of its board members—the site has received more than 40 million hits to date. And it now provides support to family members of military personnel here in the States as well. They wanted to spread the word that home cooked food may be missed but cannot be sent overseas to the military. 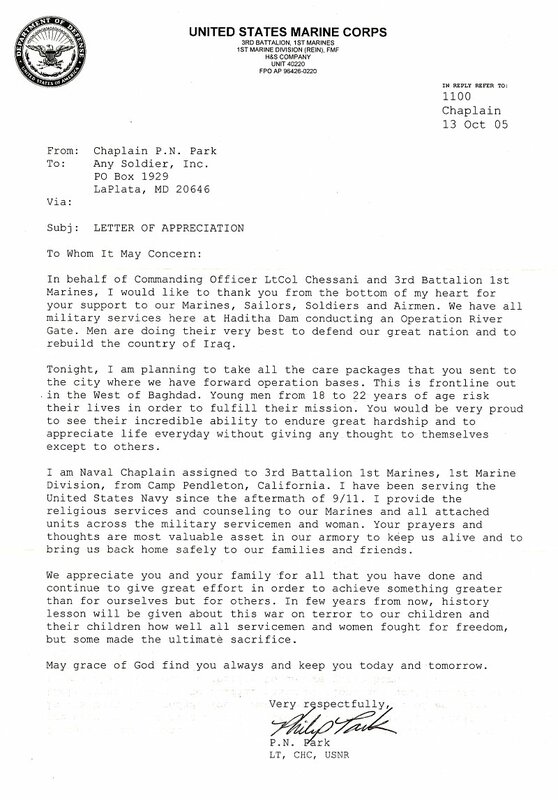 However, there were many items that were needed, and care packages as well as letters of support were solicited. 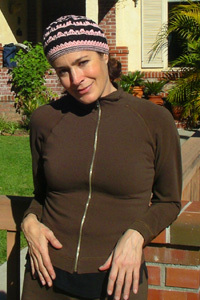 The website lists some of the most desired items to be sent, from beef jerky to sunscreen and kneepads. 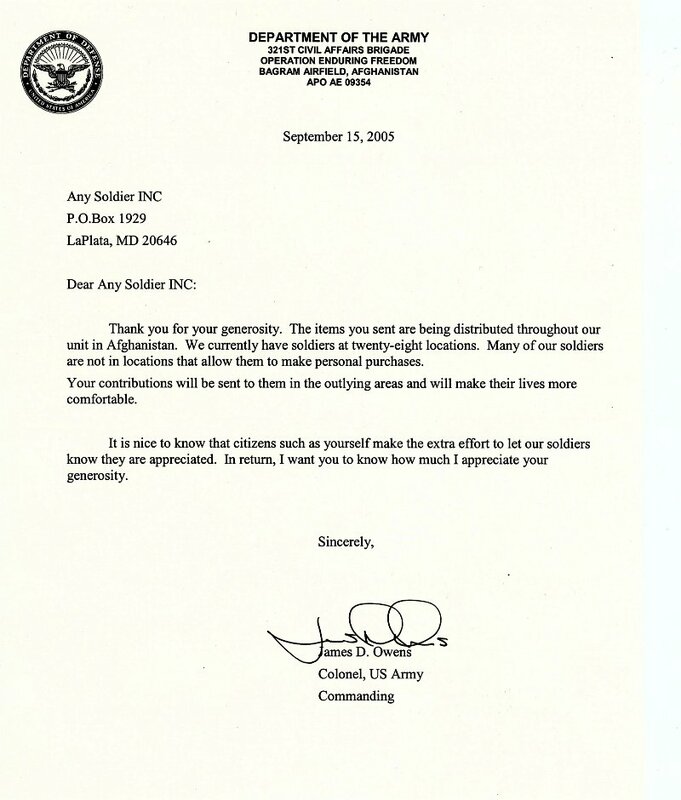 "Any Soldier Inc." is a non-profit 501(c)(3) corporation registered in the state of Maryland on June 2004. "Freedom isn't free!-just ask Any Soldier" is the motto. "We are very proud to welcome Marty Horn to our advisory board," said Doug Scott, president and CEO of Platinum Television Group. "The relevance of this series cannot be overstated. We are excited to present these options to our TV audience, the informed and discriminating viewers of Today's Family." 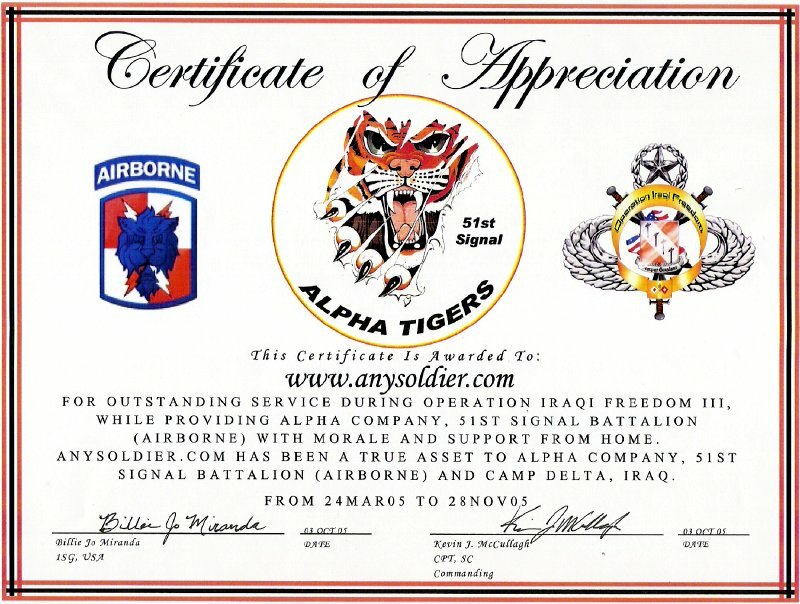 5 August: "Volunteers send contributions to Iraq"
31 July: "Care packages, Program helps support troops"
28 July: "Support for U.S. soldiers"
27 July: "Web Site Puts Soldiers in Contact with Donors"
27 July: "Locals keeping service men and women in their hearts"
27 July: "Web Site Connects Troops To People Back Home"
26 July: "Soldiers read to children via video"
25 July: "Community welcomes home a military hero "
22 July: "Show those the troops that you care"
17 July: "At-home army aids troops with a supply line of love"
14 July: "Golf in Iraq, a continuing giving saga "
14 July: "Senior project ensuring no soldier feels forgotten"
14 July: "Support the Troops: Care package collection at the Michigan & State Theaters"
12 July: Stardust Radio, http://www.stardustent.com/ has AnySoldier.com for an entire hour! Thanks to "Lady ZB" and all of folks at the station! 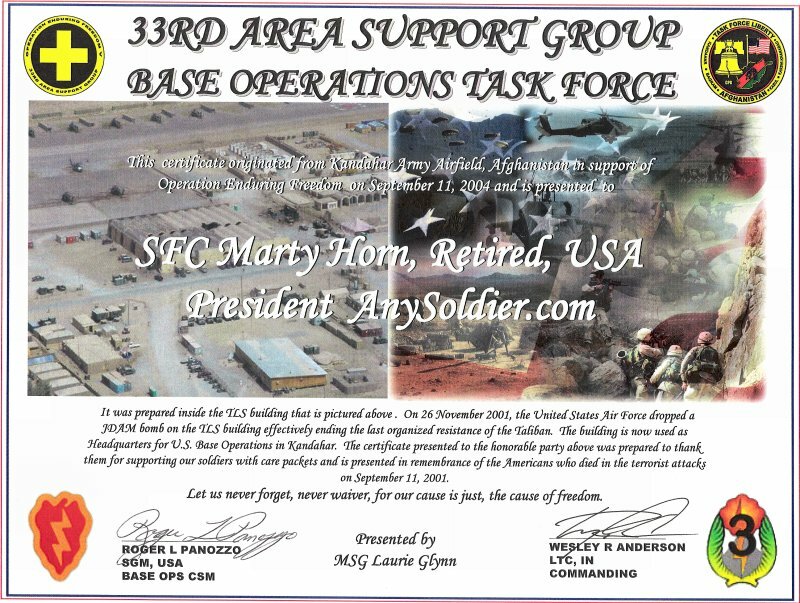 "Supporting our troops - how you and your family can help"
Marty Horn - SFC, USA MP, Retired - President of Any Soldier, Inc.
6 Jul: A HUGE "Thank You!!" to The Kroger Co. for running mention of AnySoldier.com on their ad. Special thanks to Kirk R. W. Douthit, Customer Marketing Manager, who came up with the idea and volunteered to do this. My understanding is that the ad is nation-wide. Thank you, Kroger!!! Our grateful thanks for this surprise to the author/artist, David Horsey! 2&3 July: (Austin TX) - With a win in Junior Dragster Advanced and a Runner-up finish in Hays Stock, AsleepAtTheWheelRacing team drivers Dylan and Tim Lee celebrated a special Independence Day weekend at the Tulsa IHRA Division 4 Mr.Gasket Pro-Am Sportsman National event. Team crew chief Judy Lee stated, "Because they are ensuring our freedoms to do things like race, we are dedicating our win & runner-up finishes from this event to the soldier volunteers overseas supporting the AnySoldier.com efforts. We especially want to thank the IHRA and Tulsa Raceway announcers for reminding everyone of the soldier's sacrifices on this Independence Day weekend"
1 July: "Fly the flag: Remember the troops this weekend"
30 June: "Flag journeys from Iraq to Wayland"
27 June: "Troops in Iraq value gifts from Brevard"
23 June: "We know what 'support' stickers mean"
23 June: "Three baggage workers charged with theft from soldiers"
Mo City quilters hope that Oprah will film segment on united efforts to support troops"
21 June: "'Toy' soldiers: Gifts inspire, save lives: PV lady wants to win war with toys, not guns"
12 June: "Miller Salutes Sgt Brian Horn, May's Unsung Hero of the Month"
12 June: "Care packages are always appreciated, but sometimes they can be hit or miss"
9 June: "Miller Unveils Soldier Recognition Program, 'Miller Unsung Heroes,' With Stars & Stripes Newspaper -- Sgt. Brian Horn Brown of LaPlata, Maryland Selected as First Award Recipient -- "
8 June: "Reach Out and Touch "Any Soldier""
20 May: "Students spark tremendous response in creating care packages for soldiers"
19 May: "Golf clubs raise the military’s morale"
11 May: "Neighborhood group shows love for troops"
Melissa Sullivan Exemplifies The Spirit Of South Florida"
6 May: "BATC gets behind tool drive for soldiers"
5 May: "Any Soldier: Providing a Way to Support American Troops--Even from France"
29 Apr: "Eighth grader organizing care package effort for U.S. troops"
27 Apr: "Support for troops grows in Pacifica"
26 Apr: "Culpeper soldier glad to be home"
24 Apr: "Irish Hills' top citizen helps troops in Iraq"
24 Mar: "Web site gets messages to troops in Iraq"
24 Mar: "200 Soldiers read to their kids from Kabul"
22 Mar: "Kabul Soldier Reaches Volunteer Program Milestone"
18 Mar: "It figures: Ryan skated into stand-up spotlight"
10 Mar: "Support troops with comfort of home"
9 Mar: "Afghan boy loves N.Y."
3 Mar: "Asleep at the Wheel Racing Team partners with AnySoldier.com to promote care packages to soldiers"
2 Mar: "AnySoldier.com enables all to aid troops"
28 Feb: "Check out www.AnySoldier.com"
21 Feb: "Democracy grows in troubled Iraq"
19 Feb: "Soldier's mission: Help Afghan children"
17 Feb: "Curves organizes Troop Valentines"
10 Feb: "OUR FRIEND JET IS OUR WATCHDOG"
10 Feb: "Letter: Books sought for soldiers"
8 Feb: "Relative of soldier encourages others to adopt an overseas military unit"
7 Feb: "Tie on virtual yellow ribbon at troop sites"
31 Jan: "Sending Care Overseas"
29 Jan: "Web site provides 'any soldier' care package option"
Stars and Stripes (PDF version, local copy) (original link HERE, may not work). 23 Jan: "Story of giving "
19 Jan: "WEBSITE HELPS YOU HELP TROOPS"
18 Jan: "I WANT YOU"
10 Jan: "Utah Guardsmen help get Afghan boy heart surgery"
8 Jan: "Won’t you be mine? " 4 Jan: "Program brings parents home to kids on tape"
2 December: A Visit and Donation from the Blue Knights! 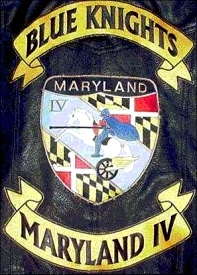 Members of the Blue Knights Maryland Chapter IV stopped by to leave a very nice donation. It is a real honor to be recognized by a group of such outstanding individuals. We rely on them to protect us in our world of peace, and they support those protecting us in war. Bob has been heard on the Howard Stern Show! 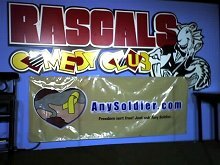 Rascals Comedy Club at the Hilton Hotel, Cherry Hill, NJ. 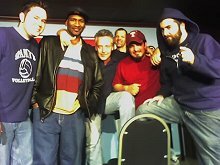 Picture (R) of Bob Levy (center), to his left in the leather jacket and cap is Keith Purnell, surrounded by other comedians who donated their talents for this show. 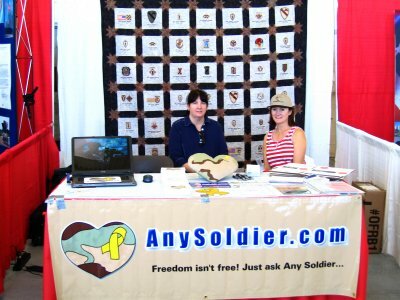 AnySoldier.com was represented at the Miramar Air Show, San Diego, CA from Friday 14 October to Sunday the 17th. Support Junkies Candy and Judy did all the work, Marty was there to say "Hi" and pass information on to everyone. The "Any Soldier Quilt" was there and drew a lot of attention. Pictures of the event HERE. Della Williams (wpd232@hotmail.com) from Wentzville, MO PD is organizing a Softball Tournament between Police/Fire/EMS of St Charles County, MO on Oct 15th, 2005 at TR Hughes in O'Fallon to raise money for Any Soldier Inc.
For further information, contact Della by e-mail! 23 September: Our thanks to the staff of "Stars and Stripes" for inviting Brian and Marty to their offices in D.C. to meet their staff, a tour of their facilities, and a great lunch. 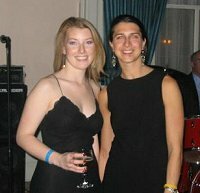 18 September: Ferrari - Maserati of Long Island "Rally to Brooklyn" to benefit AnySoldier.com! A HUGE "Thank YOU!" to Alfredo and the many folks that turned out for the rally in the most breathtaking city block of exquisite cars most folks will ever see. The weather was great, the food amazing, and the donations were a blessing! Pictures HERE. Their pictures HERE. 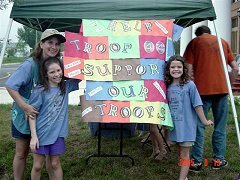 26 August & 2 September: A magazine drive that Troop 44 did at the summer concert series in Downtown La Plata, MD. 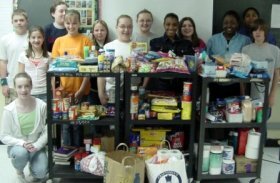 The girls managed to collect almost 140 lbs of donated items. While our focus was on reading material (magazines & books) we also collected other things like baby wipes, beef jerky, hygiene items and individually packaged snacks. During the concerts, we invited the children over to make cards for us to send in the boxes with all of the donated items. We then had a slumber party where the girls made a short video telling our men and women to "come home soon." All of the girls helped pack up the boxes and made "packed with love" cards. We managed to pack 20 boxes and chose 10 different units to be the recipients. They should be arriving to the AnySoldier.com contacts any day. Thanks for all that you do for our service men and women. A message for the service men and women HERE. Betty and Larry Lodewick are pictured at a gun show at VFW Post 1503 (Dale City, Virginia). 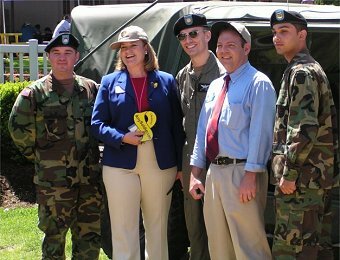 The Lodewick/Lloyd family put on an AnySoldier.com exhibit that netted a sizable amount of donations and interest in the program. 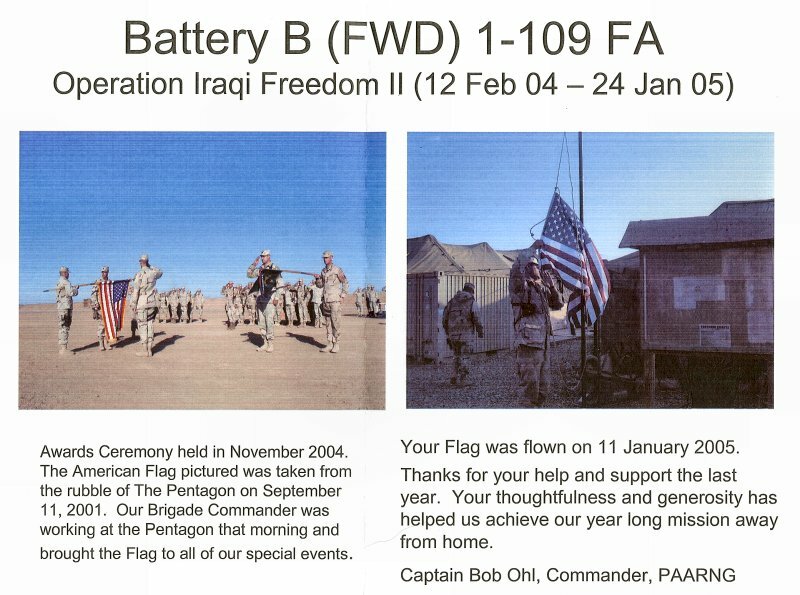 Hundreds of attendees received flyers and selected soldiers' messages (with pre-addressed envelopes) to write to. Lots of young people were encouraged to write to soldiers and send them their used video games and DVDs in flat rate envelopes (provided). 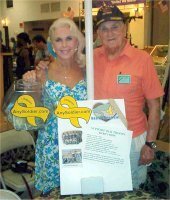 Valerie Lloyd planned the event and staffed the booth; husband Bob Lloyd built the banner frame and handled logistics; son BJ Lloyd contributed labor and support; father Larry Lodewick sponsored the exhibit and designed the banner frame; and mother Betty Lodewick enthusiastically promoted the effort as she passed the fishbowl and garnered mucho $dinero$. 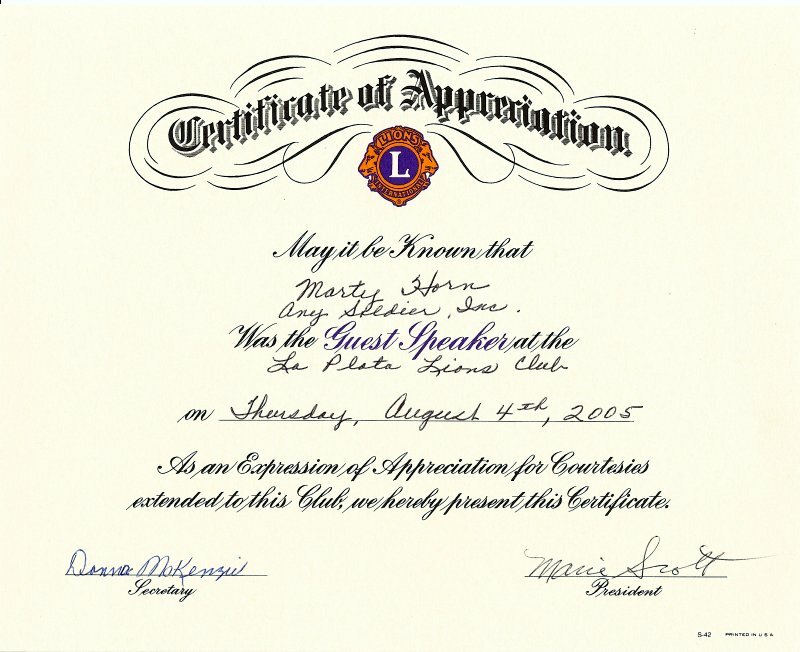 15 July: Under the direction of Mike Moors, the Ravinia Club in Atlanta raises about $3,000 for Any Soldier Inc.! Our thanks to Mike and all who attended!! The Annapolis "Harley Warehouse" in Maryland hosts a "We Support Your Service" event in their beautiful showroom. A band, food, Cheerleaders from the Redskins, great weather, and friendly folks made for a really fun day. Not to mention the tons of amazing bikes. 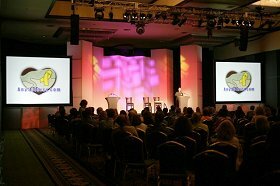 International Inc. invites Any Soldier Inc. to present it's program to 250 of their business partners in San Francisco. The Marriott went all out to make it easy to support the soldiers. 23 May:"The Salem Middle School National Junior Honor Society in Chesterfield County, Virginia mailed FIFTEEN large care packages to soldiers serving in Iraq and Afghanistan. 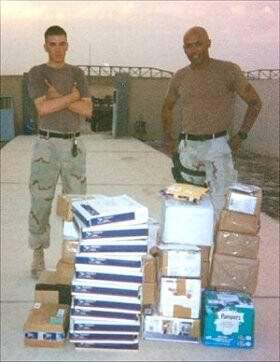 We sent the packages to the Army, Air Force, and Marines. Sheeler and Verity, our CCI dogs, (Canine Companions for Independence) made sure that one box went to a K-9 unit. 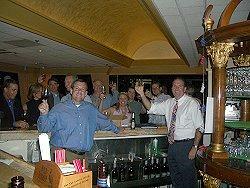 The majority of the items were donated by the 2005-2006 members, and the boxes were “topped” off by the Salem staff. It was very exciting to get the boxes to the post office. We can’t wait until the soldiers get them. We included in each box health/beauty aids, snacks, other goodies, a short note about Salem, and a poem written by B. Hoover (a Salem student). This was a great service project for us. 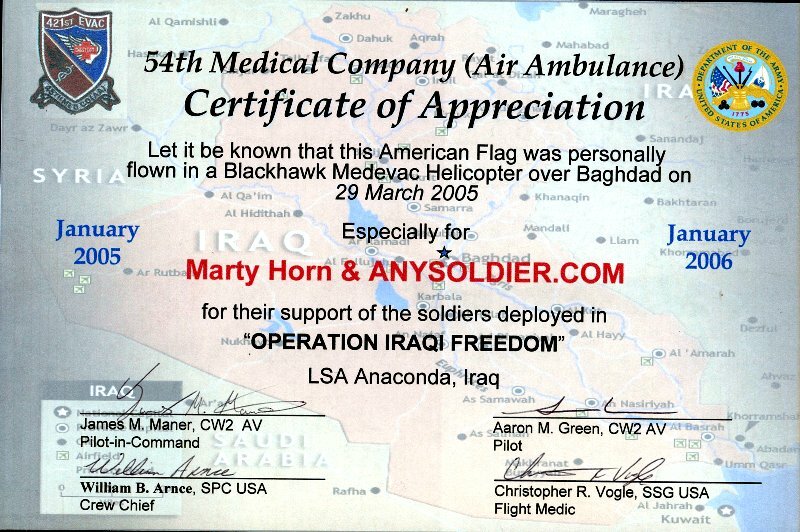 It certainly wouldn’t be possible without SUPER donations, and the www.AnySoldier.com site which made it SOOOOO easy." 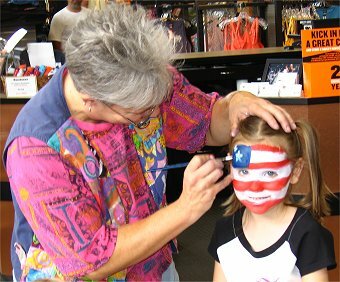 Dutch Wonderland Family Entertainment Complex in Lancaster, PA, honors the soldiers with an "Armed Forces Appreciation Weekend". In October last year, correctional officers placed collection boxes at all the Charles County Sheriff's Office facilities to begin collecting supplies to send in care packages to troops overseas for the holidays. Soon after, all the boxes were overflowing with gifts, from Chapstick to beef jerky to soap and toothpaste. The Correctional Officers Association prepared 50 care packages and sent them over the holidays in December. They collected so many supplies that they were able to send 25 more packages in the spring to remind the troops that they are thought of throughout the year, not just during the holidays. 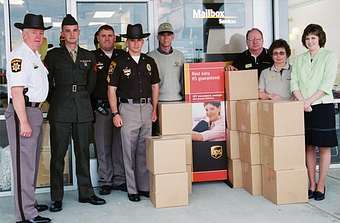 Jim and Cathy Witthar, franchise owners of the UPS stores in Waldorf and La Plata, sent the first 50 packages at no cost and offered to send the spring round of packages overseas at cost as well, saving the Correctional Officers Association hundreds of dollars in shipping fees. 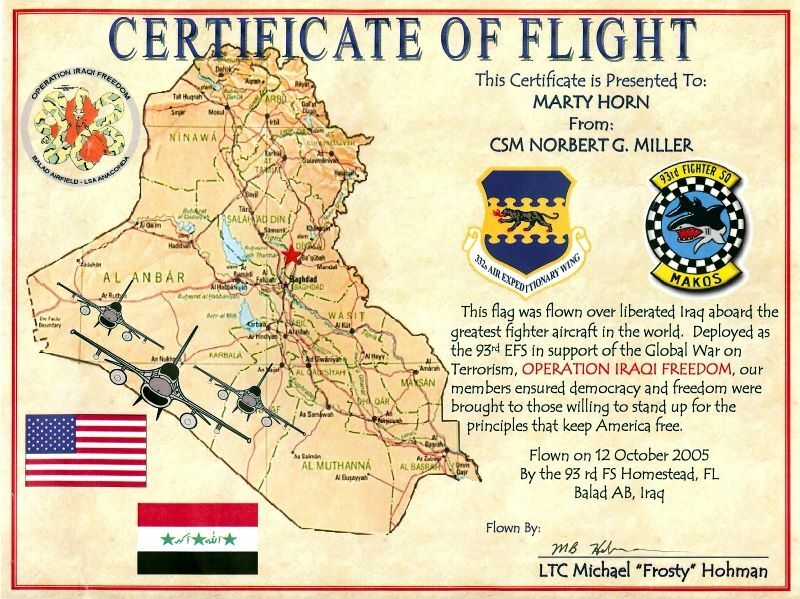 "I'm former military myself and I wanted to do something to help," said Jim Witthar, who, during the Gulf War, sent first class letters free of charge. 15 May: (Belleville, MI) People to People Student Ambassador Program is pleased to announce their 2005 Wayne county student ambassadors collected enough supplies to fill over 100 boxes. The items included; $800 in pre-paid phone cards, lots of great food items, socks, books, magazines, cd's and assorted hygiene products, then sorted and packed boxes for shipping to United States soldiers serving in international locations on Sunday May 15th at Open Arms Lutheran Church in Belleville, Michigan for their community service project which has global reach. Each Student Ambassador delegation has the opportunity to do a community service project prior to their departure. This delegation group is the first to ever choose a "local project with global scale". They have chosen to gather items locally to send overseas to soldiers worldwide through a website called "AnySoldier.com". The May 15th event began with a general meeting with Delegates giving presentations on Australian culture, food, currency, packing tips and final departure reminders. Delegates then gathered items from cars, vans and trucks to bring inside the facility to sort and prepare for packing. Boxes were assembled, filled with many assorted items, hand written cards, labeled and sealed for shipping. A brief pizza break helped them finalize details and clean up. April: The Hollywood Video, Wilsonville, OR, Transportation team recently spearheaded a collection effort - through vendors, suppliers and fellow employees - that generated 200 care packages for our soldiers overseas. Given the nature of Hollywood's business, the boxes were largely filled with a variety of DVDs and Video Games (including Xbox Halo 2! ), but also included personal and comfort items for the troops. 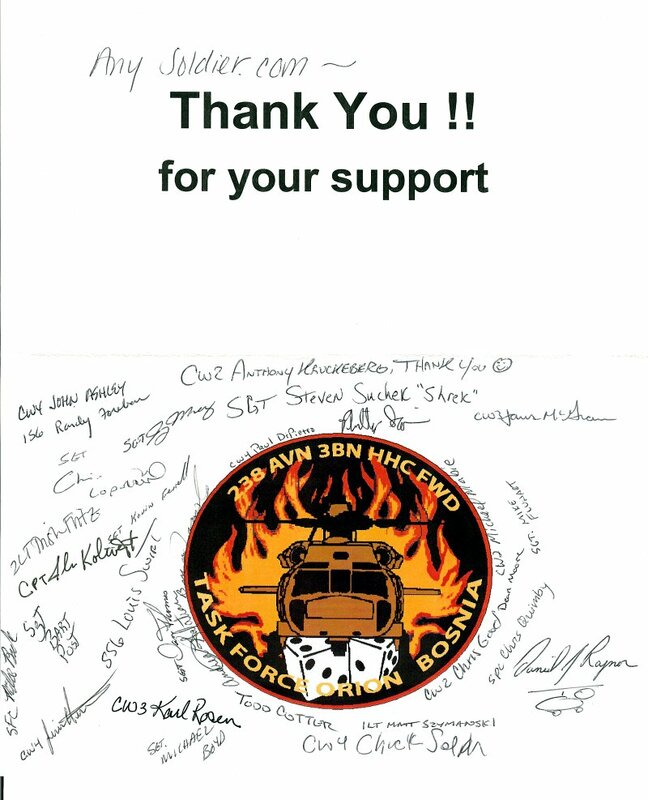 Through the information and inspiration of the "Any Soldier" program and website, this collection effort was truly a success and it galvanized the Transportation team behind this very worthy cause. 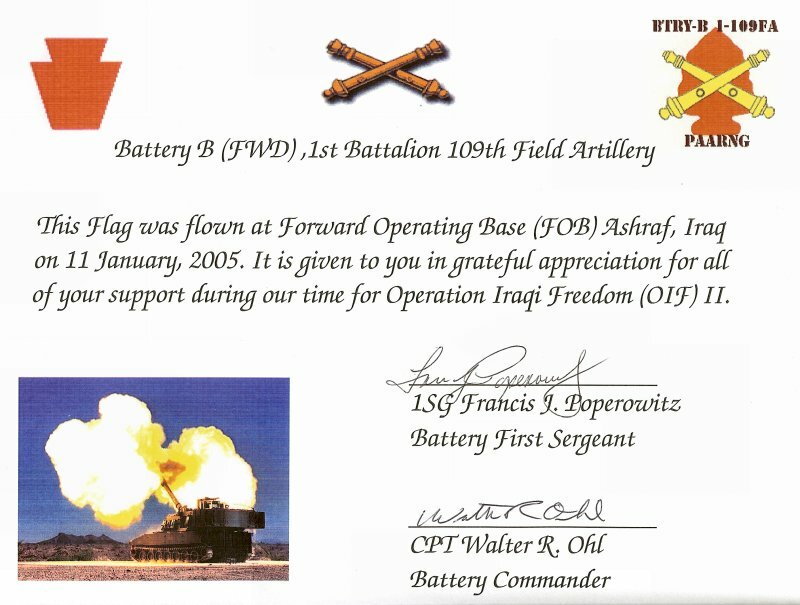 What started as an idea to support immediate friends and family in Iraq, ended up with a surplus of goods to that will send a message of support to a few hundred soldiers. Special thanks goes to VP of Marketing, Doug Orloff and the Hollywood Video Marketing team for picking up the costs to ship the goods overseas. But most importantly, so much credit goes to the Transportation team for giving their time and energy to support our troops. The Asleep at the Wheel Racing Team (aatwracing.com) recently announced they will race under the AnySoldier.com logo at all IHRA Division 4 Pro-AM events along with the 2005 IHRA Junior National and the 2005 Amalie Oil Texas National events held in San Antonio TX. The family will race their 86’ Olds Cutlass in Stock Eliminator class along with Dylan Lee competing in his junior dragster. Team co-owner and driver Tim Lee stated "Our plans are to provide visibility and promote participation in the AnySoldier.com organization’s one of a kind military care package effort". Judy Lee, co-owner and crewchief stated "We will also race and promote AnySoldier.com at selected ET/bracket race events at IHRA division 4 tracks, along with actively sending care packages to units. We’ve decided this is one of the most rewarding things we can do as a family". Not to be left out of the promotional effort, Junior Dragster driver and team member Dylan Lee suggested the team also endorse AnySoldier.com at the IHRA Junior Dragster National Event level. On behalf of AnySoldier.com, the Asleep at the Wheel Racing team will award a $100 savings bond to the winner of each of the junior driver’s age group classes contested at the 2005 IHRA Junior Dragster National events. 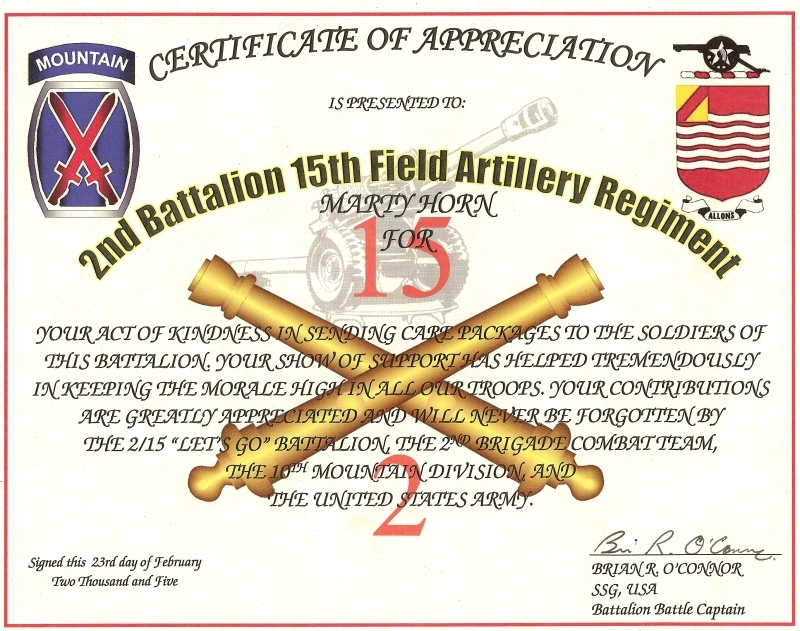 To be eligible for the award, similar to any other vendor contingency, the winning junior dragster must display AnySoldier.com decals, available for purchase through the organization’s website. "This will likely be one of the most economical, and easiest to participate contingency awards ever", stated one of the team members. Representatives from the IHRA sanctioning body were also excited to have such a unique and worthy cause participate in the contingency program. 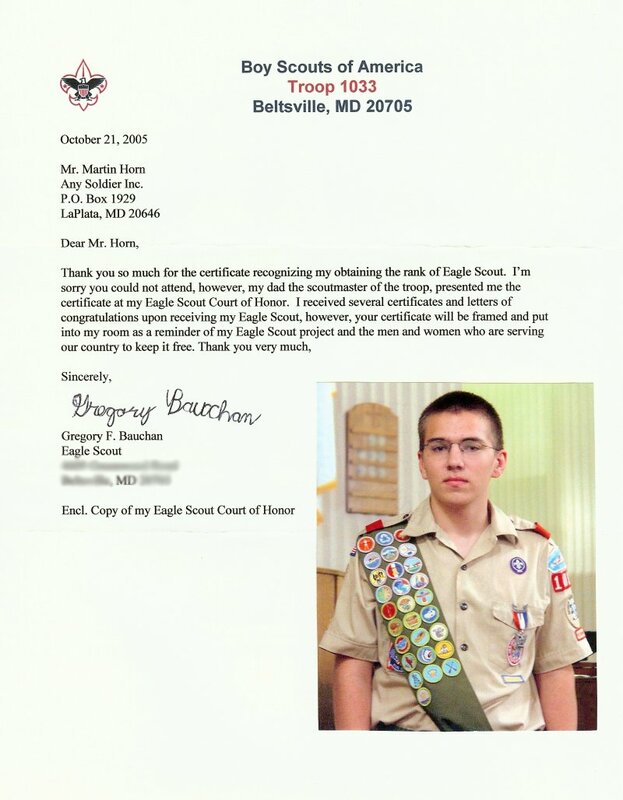 Feb-Mar: Gregory Bauchan is a Boy Scout in Troop 1033 in Beltsville, MD. 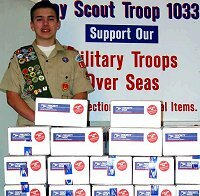 His Eagle Scout project involved collecting personal items and donations to send over 100 care boxes for soldiers from Maryland serving in Iraq. 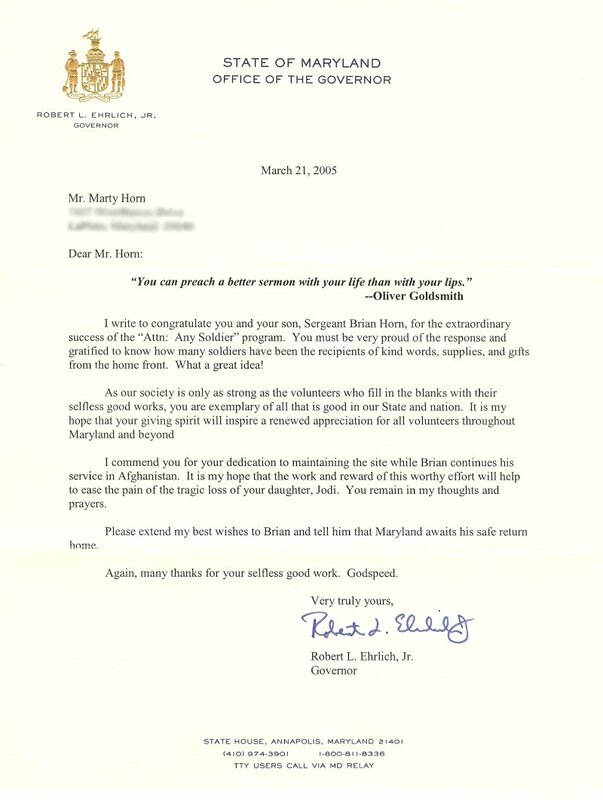 He was able to identify troops from Maryland serving overseas by using the web site AnySoldier.com. Gregory assisted by the boy scouts in Troop 1033 collected items from the Beltsville community at Emmanuel United Methodist Church and at St. Joseph Catholic Church. 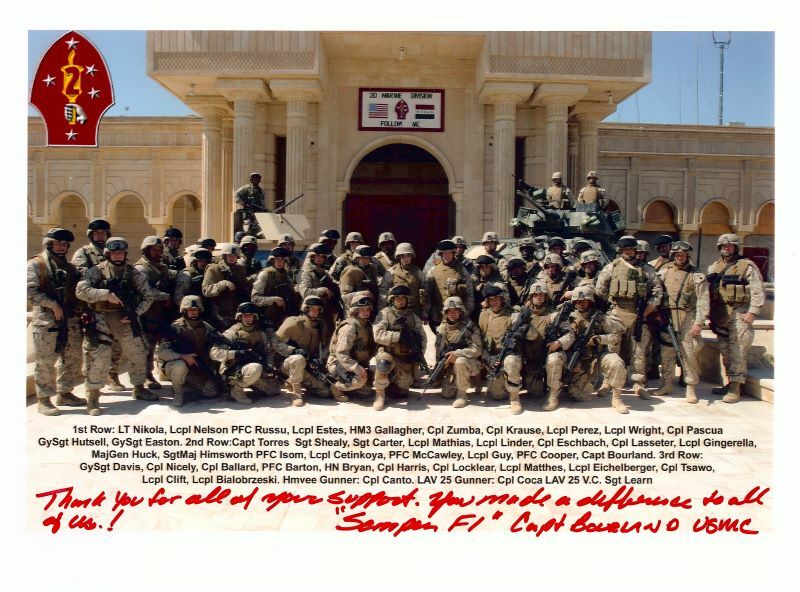 He sent packages to three different groups the HHC 129th Signal Battalion, 29th ID Maryland Army National Guard, the 1225th Corps Support Battalion, 818th Maintenance Company and the HHC 46th Corps Support Battalion all serving in Iraq. 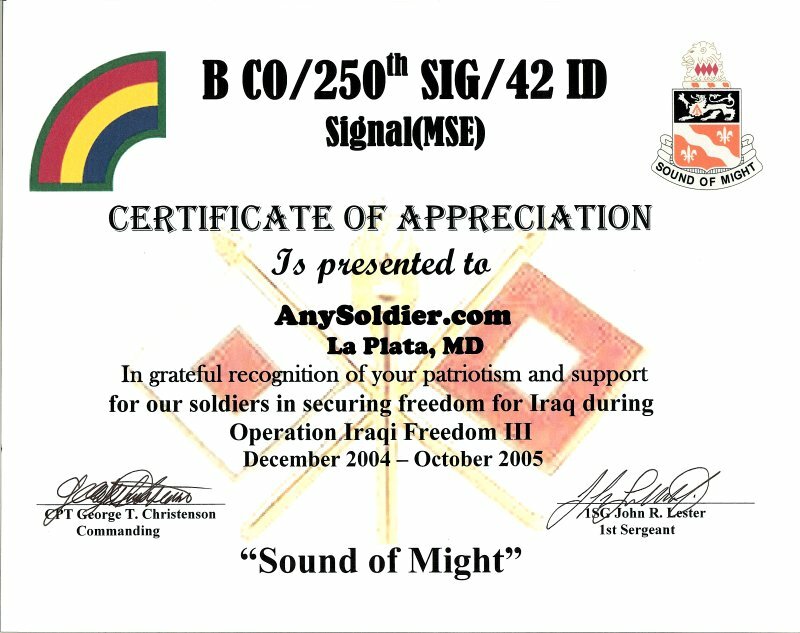 The first soldier, a National Guardsmen for 9 years, to send him a thank you e-mail was a soldier who is an Eagle Scout himself. 28 Feb: As a Spring service project, and to fulfill a requirement for the American Patriotism Interest Project, the troop decided to write letters and send “Care” packages to US Active Duty troops. With help of the internet, the project was surprisingly easy to do, since we found a website designed specifically for this purpose! 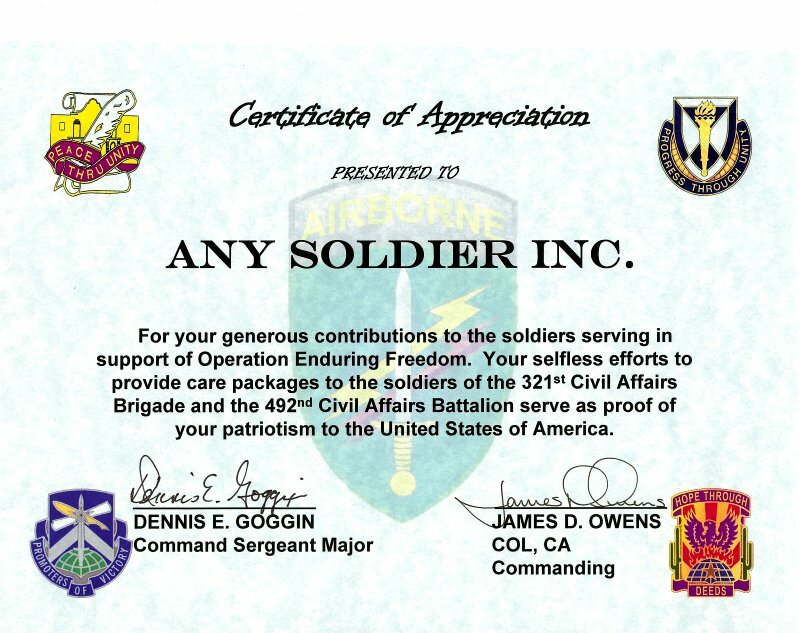 http://AnySoldier.com/index.cfm has a listing of many different soldiers and their platoons/divisions on active duty. This site also gives you information about them, along with a list of items they would love to have sent. 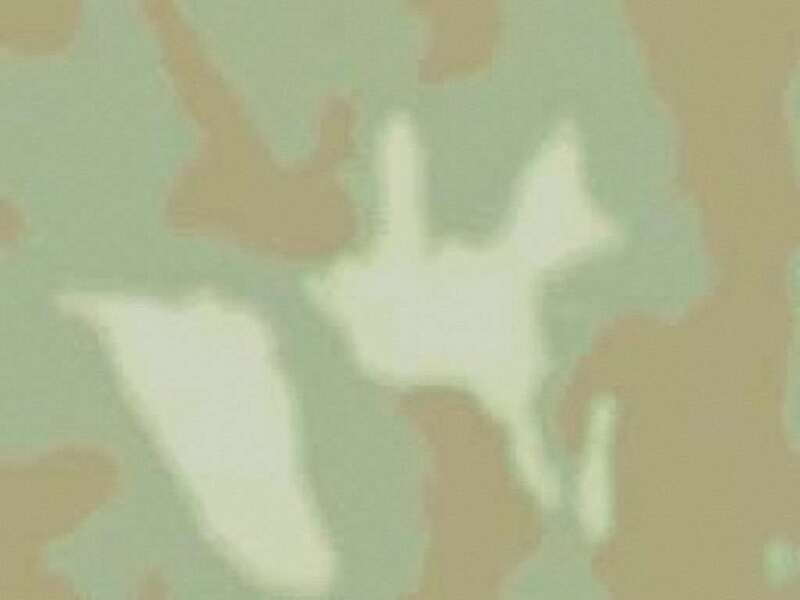 We selected a PFC Kelly M. Dahle, who is with Delta Co 3D SSB. 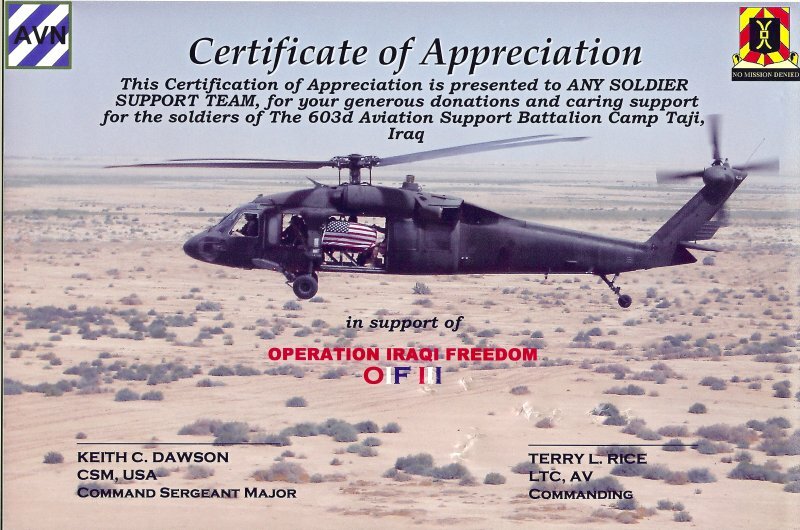 They are stationed in Iraq until March 2006. We sent 17 boxes, filled to the brim with items that were on the Delta Company’s list. The girls brought in loads of nonperishable snacks and toiletries of all kinds. One of our parents donated a case of toothbrushes, toothpaste, and dental floss from the Dentist office where she works to the project. Many of the girls also included CD’s, DVD’s, Playstation games, books and magazines to help entertain the soldiers. The troop purchased some items for the care packages, including a box of Girl Scout cookies from each girl in the troop (her favorite kind!) Stationary & Envelopes, candy bars and gum, and paid for the postage. The boxes were shipped in the new USPS Priority Mail flat rate boxes, at a rate of $7.70, regardless of the weight or destination. The entire troop participated and enjoyed being able to thank and give back to our troops in the field who are keeping us safe, and free. 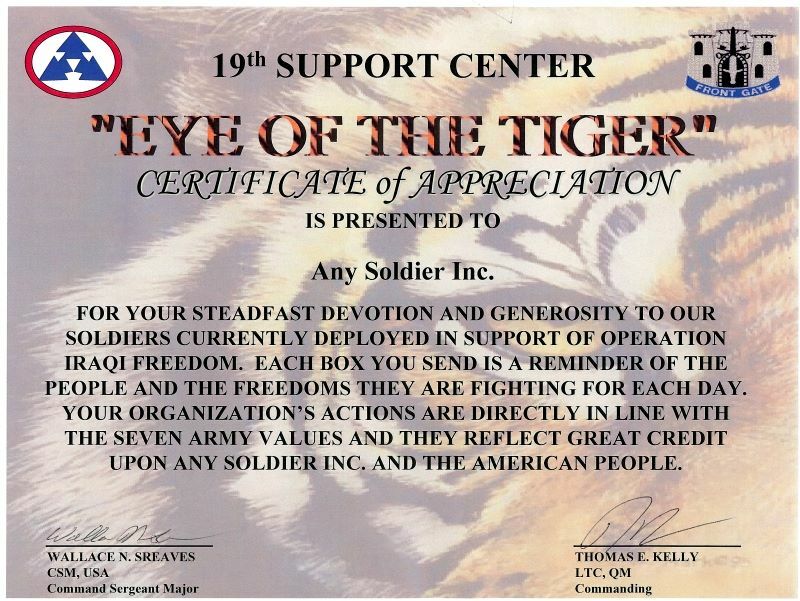 It was a wonderful experience, and we may adopt this Company for other care packages – since they will be there for a while. We encourage anyone who is looking for a way to show support to our troops to log on to the website, and find a soldier to adopt. 11 Feb: Supporters gathered for a cocktail reception at the Union League Club in New York City to raise money and awareness for Any Soldier Inc. With more than 200 guests, over $9,520 was raised for the organization! VERY special thanks goes to (center picture) Kelly Fuhrman(L) and Liz Barney(R) for all they did to put this together! 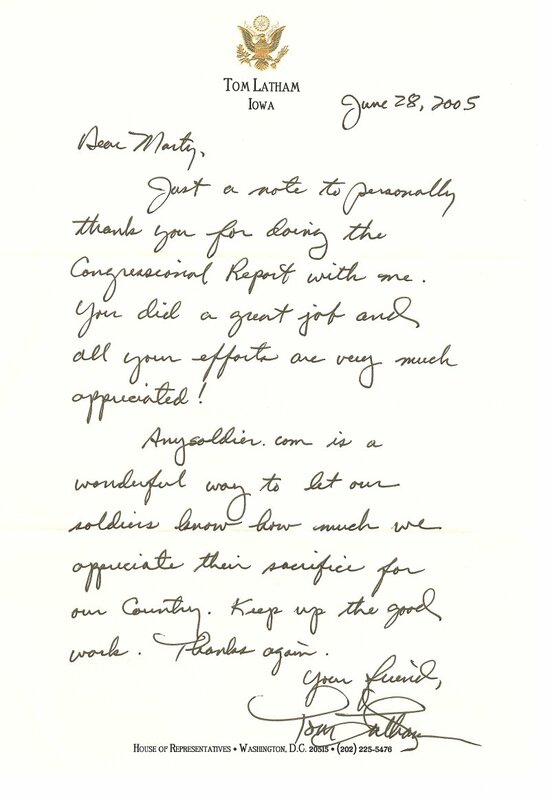 "Hey, it is absolutly my honor to send things over to the soldiers and thank you very much for defending our country and making it safe for my children and future generations! love Sean". 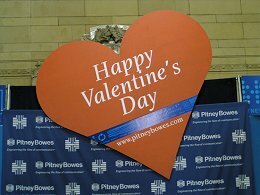 7 Feb: Pitney Bowes teams with actress Aisha Tyler and AnySoldier.com in Grand Central Station, NYC, to send Valentines day cards to the Soldiers. More HERE. 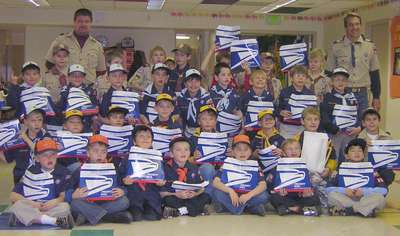 27 Jan: Cub Scout Pack 888 sending off 35 packages that the Cub Scouts put together for the servicemen/women serving in Iraq. They decided to send them to various Marine contacts from "Attn: Any Soldier" because the Marines from their local recruiting office in Colorado have been very helpful in performing the Pack's Uniform Inspection for the past 2 years -- and they figured this would be a good way to show them their appreciation. 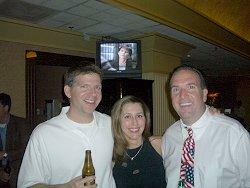 6 Jan: The Law Firm of Liechty & McGinnis, P.C., located in North Dallas, TX. put together a second round of packages for 100 soldiers. Mr. McGinnis put up $1,000 of his if the employees matched it, which they went to $1,400 in matching! All the packages are bundled together in plastic baggies, one for toiletries and one for goodies and snacks, then tied together with red and blue ribbon.